Documenting Peter Minshall’s recollection of the first band he ever designed under Stephen Lee Heung. Veteran producer of masquerade bands for Trinidad Carnival, Stephen Lee Heung, invited Peter Minshall to design his presentation for 1976 Carnival in Trinidad. 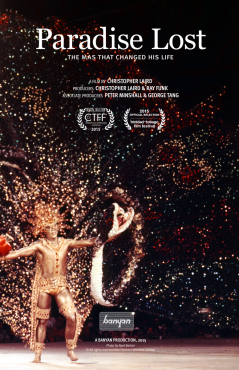 Paradise Lost was the band and this documentary provides a blank canvas on which Masman, Peter Minshall, in all his personality, relates the story from the concept to the crossing of the stage at the Queen’s Park Savannah. The legendary Masman tells the story with the aid of his beautiful drawings of the costumes and live footage as only Minshall can. Christopher Laird is the founder/CEO of Gayelle The Channel, and the co-founder of Banyan Productions, Trinidad’s first ever independent production company. He has produced over 300 documentaries, dramas and other video productions with Banyan Ltd. over the past 35 years garnering a score of national, regional and international awards.